a. The Bible indicates we are looking for Jesus, not looking for the signing of a treaty, the revealing of the anti-christ, the seven seals, etc. j. Pre-wrath says Jesus cannot come back today because we are still 5-6 years away. e. Did the 69th week end in 26 AD (baptism of Christ) or 30 AD (crucifixion of Christ)? ii. The trumpets and bowls must be worse than the anti-christ’s persecution, yet the anti-christ’s persecution is said to be the worse time. c. But, when does the Great Tribulation (time of persecution end? d. All agree that the 70th week of 7 years is not shortened. f. Does the Scripture teach that the 3 ½ years (42 months, 1260 days) is the short time? Or, the adjusted time Jesus spoke of? Meaning, was this time of judgment on the earth to have been longer, but God shortened it to 3 ½ years? j. Pre-wrath says God shortens the Great persecution to spare flesh, but then this is followed by the Great Day or the Lord where the trumpets and bowls are poured out. The Day of the Lord is worse than the Great Tribulation. How can any survive the Day of the Lord? i. 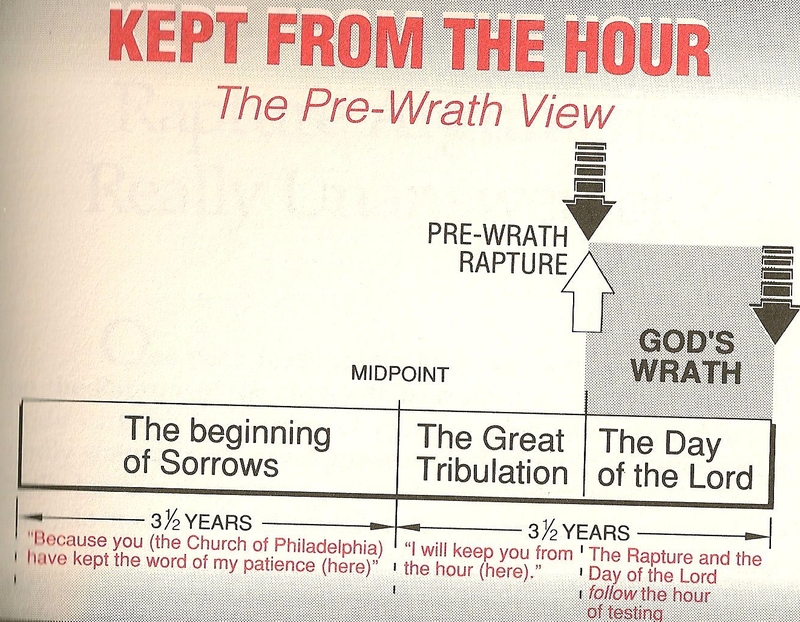 The Anti-christ persecution goes to the end of the 70th week for a full 3 ½ years (1,260 days), but eh Great Tribulation is supposed to be cut short by the rapture and interrupted by the Day of the Lord. iii. Jeremiah 30:7 (like Matthew 24:21) says this day is the greatest (worst), none like it, yet it is followed by the terrible Day of the Lord. d. Pre-wrath explains this by saying that it is the Jews who say “Peace and Safety” since they see Jesus returning for the church, but they are left behind and destruction begins. c. The later pains are known to becoming once the initial pains begin, so they are not a surprise. They are predictable and very intense. f. Pre-wrath assumes that 1 Thess. 5:2-3 is the hard labor, but the hard labor pains are not a surprise. h. Pre-wrath has the hard labor giving birth to the Day of the Lord, not to deliverance and joy. j. Jeremiah 30:6-7 - read this – concerning the great birth pains that Jesus was building from when he used the same illustration in Matthew 24:8 of the early pains.